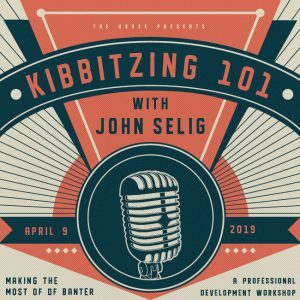 Join The House and Jon Selig for a crash course in Professionally Kibbitzing, but really it’s a workshop covering comedy and joke writing that can be applied to your day to day life, personally and professionally. Use the skills and techniques you’ll learn here to help you with your processes connect with others, and build relationships. Whether you are in sales, finance, or fundraising, an entrepreneur or a lawyer, this evening is for you! The power of making someone laugh or smile can go a long way!